For the past several months, I’ve hinted at a secret, exciting new project. Today, I’m excited to let you all know what that project is. I’ve teamed up with seven talented chicklit/romantic comedy authors to put out a series of novellas – the Oceanic Dreams series! Legend says a person with an open heart will meet their true love within a day of boarding the Oceanic Aphrodite. Siggy’s on the run, Liv’s taking her first vacation in ages, and Holly just wants to get to one million subscribers. But each of them finds a bit more than she bargained for. Will these 8 Sassy Singles sail off into the sunset with their matches or abandon ship? 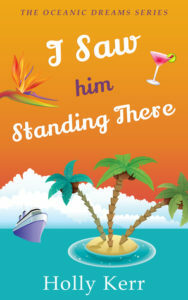 The series kicks off on May 20, 2019 with Holly Kerr’s novella, I SAW HIM STANDING THERE. I’ve read this, and let me tell you, it’s awesome. This stowaway sets sail for love! Small-time con artist Siggy needs to get out of town fast. When she’s offered tickets on the legendary Oceanic Aphrodite cruise, Siggy jumps at the chance. A week on a luxury cruise ship, with a suitcase full of clothes and all expenses paid? Yes, please! The only catch is that she has to pretend to be someone else. No problem. Siggy has no intention of getting close enough anyone to discover her secrets. But this is the Oceanic Aphrodite and love is in the air. When Siggy sees assistant cruise director Will taking tickets, Cupid’s arrow hits the target. Luckily, Will’s too busy smiling at her to check out her fake passport because he’ll toss Siggy off the ship if he finds out about the scam. Onboard, dolphins and cameras and runaway ferrets bring Siggy and Will together. The more time they spend together, the more Siggy wants to tell him the truth. Cupid’s arrow has struck deep but is it worth it for Siggy to stop running? We’ll be doing quick releases throughout the summer, with the final installment on August 26. Pick up each installment for only $2.99 or preorder for only 99¢. Kindle Unlimited users can also read for free with their subscriptions. My contribution, THE TIME OF MY LIFE, will be released June 3. Legend says everyone who boards the Oceanic Aphrodite finds love. Janey’s on the ship to teach pole fitness, not for romance. Then she meets Frank. He’s everything Janey isn’t–refined, classy, rich–but his good looks and charm make him undeniably appealing. Unfortunately, he’s also a passenger. When Janey’s partner can’t perform in the end-of-cruise talent show, Frank offers to fill in. He’s never done pole, but she’s got time to teach him. As they grow closer, Janey finds herself hoping the legend is real–but if she gives in to temptation, she could be out of a job.